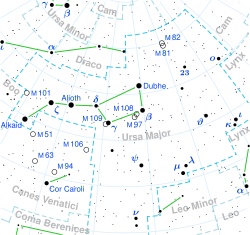 The red dot shows the location of 47 Ursae Majoris in Ursa Major. ↑ 1.0 1.1 1.2 1.3 1.4 F. van Leeuwen (2007). "HIP 53721". Hipparcos, the New Reduction. สืบค้นเมื่อ 2009-12-08. ↑ 3.0 3.1 3.2 3.3 3.4 "Stars Table". Catalog of Nearby Exoplanets. Archived from the original on 17 October 2008. สืบค้นเมื่อ 2008-10-04. ↑ G. T. van Belle; K. von Braun (2009). "Directly Determined Linear Radii and Effective Temperatures of Exoplanet Host Stars". Astrophysical Journal. 694 (2): 1085–1098. arXiv:0901.1206. Bibcode:2009ApJ...694.1085V. doi:10.1088/0004-637X/694/2/1085. ↑ V. V. Kovtyukh; Soubiran, C.; และคณะ (2003). "High precision effective temperatures for 181 F-K dwarfs from line-depth ratios". Astronomy and Astrophysics. 411 (3): 559–564. arXiv:astro-ph/0308429. Bibcode:2003A&A...411..559K. doi:10.1051/0004-6361:20031378. ↑ 6.0 6.1 C. Saffe; Gómez, M.; และคณะ (2005). "On the Ages of Exoplanet Host Stars". Astronomy and Astrophysics. 443 (2): 609–626. arXiv:astro-ph/0510092. Bibcode:2005A&A...443..609S. doi:10.1051/0004-6361:20053452. ↑ E. E. Mamajek; L. A. Hillenbrand (2008). "Improved Age Estimation for Solar-Type Dwarfs Using Activity-Rotation Diagnostics". Astrophysical Journal. 687 (2): 1264–1293. arXiv:0807.1686. Bibcode:2008ApJ...687.1264M. doi:10.1086/591785.